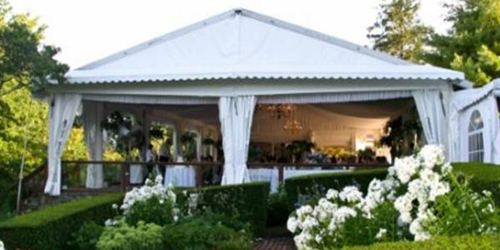 If you have dreamed of a garden wedding, the Inn at Mystic can go you one better: a garden wedding outside a mansion by the sea. The elegant inn, situated on 14 lush green acres overlooking Fishers Island Sound and Mystic Harbor, features the perfect-for-a-wedding Haley Mansion, a breathtaking Colonial Revival mansion atop a hill surrounded not only by flower-scented grounds and gardens but also a meadow pond and a waterfall. An experienced wedding staff and executive chef will help you plan everything from rehearsal dinners to your choices for butler-passed hors d’oeuvres and carving stations or plated dinners, whether your garden wedding is an intimate affair or features 225 guests dancing on the veranda.